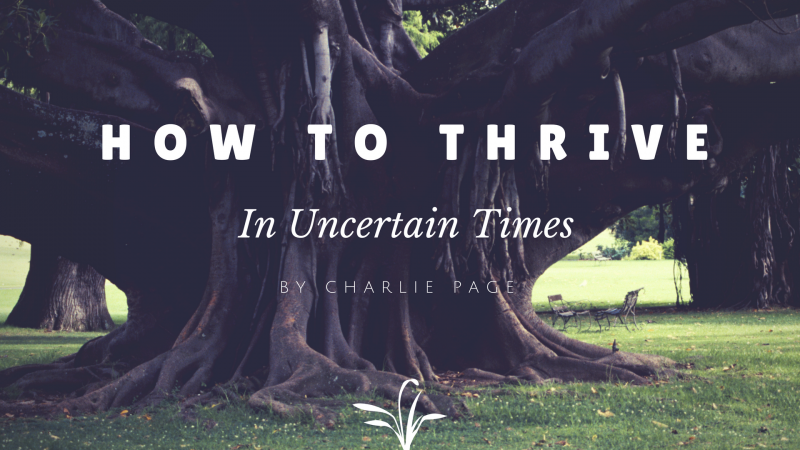 Do you want to know how to thrive in uncertain times? Have you ever noticed that some people thrive no matter what the economy is doing? Boom times or bust, they seem to stay on top and keep on going. And what about the people who prosper no matter what political party is in office? Whether the political system in the country tilts right, left or seemingly out of control, these businesses adjust, adapt and overcome. I believe there are a few keys to having the ability to prosper in any circumstance, even uncertain times. Based on my own 30+ year track record, I am honored to share these key principles with you. Hey Charlie, thanks for the good advice. My biggest takeaway was “Forget the ‘Cutting Edge'”. What helps once we’re up and running often hurts when we’re trying to get started. Too soon. Too overwhelming. We want to know everything, have the best tools and be cutting edge before we feel ready to start. That’s human nature, but it’s wrong. Actually, it’s not human nature, if we look at a child and how he learns and develops new skills, be it walking, riding a bike or holding a fork. I believe that business growth happens in stages, and each stage requires different goals, mindsets, focuses and skills to succeed and move to the next stage. In the Start stage, the only goal is just that…to start. Not to be an expert. Not to get rich. Just to start. In Start, I believe in the Magic of Thinking Small”. In other stages the magic is in thinking big. But nothing big can happen until we start, right? In the “Start” stage, it’s OK to be a beginner. In fact, that’s all we can be. We become experts as we stabilize, then scale or business. But we gotta start first, right? BTW Charlie, I can honestly say that I know of no one more qualified than you to help people develop their plan, and then implement that plan effectively, with Common Sense principles. I think it’s a calling with you. Thanks for all you do. Thank you for the kind words. It is my passion. I love what you said about stages. So very true. The problems for many people come when they try to skip a stage that, it turns out, is completely necessary to being a complete business person. Thanks for reminding me about these core principles of business. I’ll have to review my plan and get someone else to review it also. It’s always good to have a second set of eyes look at our plans. It can feel a little intrusive but finding someone you trust and respect takes that fear away.